Quality Bangles High Fashion Bracelet Bangle Bakelite. Contempory Plastic colours styles. Wholesale Bangles traditional Lucite Acrylic Modern Designs Colors hard plastics. 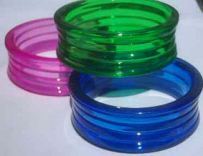 Childrens Plastic Bangles 12mm wide in assorted colours. Hard plastic bangles in childs fitting size, Pack of 12. Large 40mm wide Genuine Wood Bangles, finished in various polished wood shades. (Pack of 3 wooden Bangles). Excellent polished Real Wood High Fashion Bangles, wholesale bulk pack of 3. Designer large wide Bangles with woven straw design set in resin. 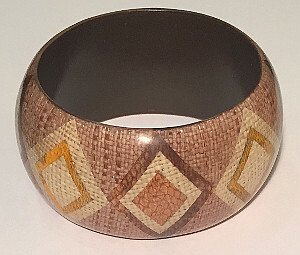 Excellent Basket Weave rustic design Bangles (Pack of 6). 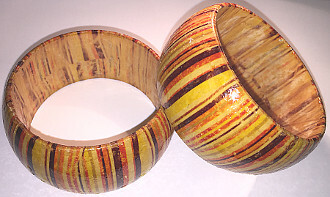 Large Candy Stripe design Hard Plastic Bangle. approx size 22mm wide. Popular Fashion design Candy Stripe Colours Bangle. Large Ribbed design Hard Plastic Bangle Large 80mm size and 28mm wide. Various vibrant Clear Tinted Crystal colours available in large rib design bangles. Large Marble TURQUOISE finish hard Plastic Bangle. Large approx 25mm wide 80mm diameter Bangle. Quality Turquoise marbled effect finish Bangles. Clear Colours Large Twist design Hard Plastic Bangle. Extra Large 95mm wide size very Chunky Heavy Bangle. Clear tinted colour finish wide hard plastic bangle. Misty finish Large Chunky Twist design Hard Plastic Bangle. Extra Large size approx 42mm wide Heavy Bangle. Massive size bangle 95mm outside diameter Misty colour finish. Bright coloured hard plastic bangles, 10mm wide size. Sold in packs of 12 assorted bright colours. Large bright coloured 28mm width approx. Plastic Bangles. Bright fashion coloured bangles approx 70mm across size, packed in 12 assorted colours. Marble colours finish Hard Plastic Bangle. approx 16mm wide Marble Pink and Blue coloured fashion bangle. Wavy shape Hard Plastic Bangle. size approx 8mm x 7mm. Wavy designer style finish. 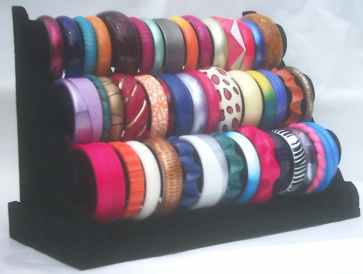 22mm real Wooden Bangles painted Bright attractive assorted Colours. (pack of 10 Bright mixed Colours).